This week we will be discussing the future of self-healing electronics with Eric Markvicka of Carnegie Mellon University. At the time of writing this, Eric is a PhD Student working on his thesis: Robust Soft-Matter Robotic Materials. 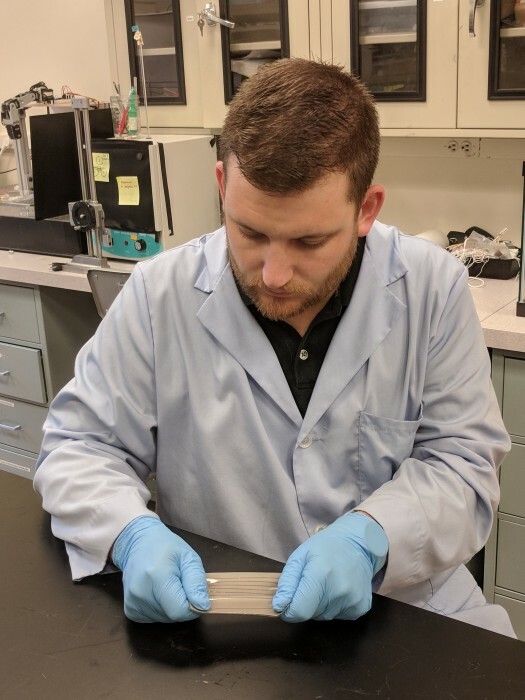 Eric is part of Dr. Carmel Majidi’s Soft Materials Lab, focusing on stretchable electronics. Jim: Eric, where can our readers go for the full information regarding your testing? Eric: The electrically self-healing liquid metal-elastomer composite is detailed in Nature Materials. This work was in collaboration with Michael Bartlett who is a professor at Iowa State. Jim: When I watched the video with the timer circuitry, all I could think of is the old scene in movies where someone gets directions to “cut the tripwire”. They cut the wire and the timer keeps ticking because it was the wrong wire to cut. In real life, would there be any issues you could imagine with self-healing circuits? Eric: I would almost argue there is no "right" or "wrong" wire as all of the wires will instantaneously self-heal when damaged. As we show in the video we were unable to stop the timer, which might make us the bad guy in this situation; however, the ability to withstand extreme damage could provide many environmental benefits by allowing electronics devices to be reusable after damage. This could also potentially provide a method for creating devices with increased reliability and safety in applications such as remote teleoperation, autonomous field robotics, or medical implants where field repair is difficult or even impossible. I’m looking forward to learning more about how this works! Check back tomorrow to learn more about the material that makes this all possible.